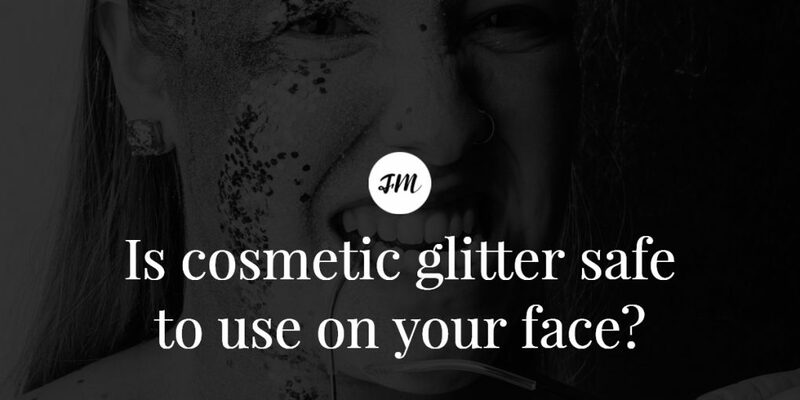 →Is Cosmetic Glitter Safe To Use On Your Face? Glitter has become one of our most beloved makeup accessories, and with festival season around the corner, we are sure to have the stuff peppered on our cheekbones, and expertly blended into our eye make-up. However beloved and beautiful glitter may be, there is one key question that needs to be answered: is glitter safe to use on our face? It’s important for glitter users everywhere to have a clear distinction between cosmetic glitter and craft glitter, as confusing the two can have truly dire effects. There is a great ongoing debate amongst makeup artists about the differences between craft glitter and cosmetic glitter. Some argue that both are equally safe to use, and others dispute this, claiming that craft glitter can be really harmful to your skin. Craft glitter was, at one time, predominantly made out of small pieces of metal, which can irritate and cut a person’s skin, this is slowly being replaced with plastic, which is cheaper and easier to make. Despite this change, craft glitter is made using poly-bonded colouring to give it a really lovely shine and colour. When in contact with moisture, poly-bonded dye can run and become sticky – just imagine applying this to your eyelids, it’s almost too painful to think about! In comparison with craft glitter, cosmetic glitter, like any other beauty product, is much more heavily regulated and rigorously tested, which means that it is created with skin-friendly dyes and colours and will not irritate or scratch. Cosmetic glitter is so much safer to use on your skin than craft glitter, so if you’re looking to avoid any nasty cuts, infections or irritation this festival season, stick to the good stuff! It’s said that the glitter makeup trend dates back to the Ancient Egyptians, who used mica dust as sparkly makeup and since then we have had an unwavering love and respect for the stuff. 90s fashion was all about the roll-on body glitter, and as we have slowly done a full circle, the 90s look is has become huge over the past, glitter has closely followed! Over the next year, chunky glitter is set to be one of the biggest festival trends, so expect to see bolder statements being made and more creativity being thrown into the mix. If you’re not so big on putting cosmetic glitter onto your face, people are alternatively sprinkling the stuff onto their roots, hair braids and curls, to create funky and fun hairstyles! The best way to apply glitter to your eyelids is to suspend it in something, whether that be a gel, cream or primer. Without laying a base coat for the glitter to stick to, you will end up with glittery eyeballs (not a good look) – even if you use the safe cosmetic glitter, your eyes can become sore and irritated if there is an excessive amount of glitter getting in them. Knowing how to safely remove glitter eye makeup is equally as important as knowing how to apply it safely. No matter how tempting it may be after a day/ night of partying with glitter on your eyes, never step into the shower or scrub your face if your eyelids are peppered with sparkles. Doing this can aggravate the sensitive skin around your eyes and can force the glitter into your eyeballs. The best way to safely and entirely remove glitter eye makeup is using an oil-based eye makeup remover and a cotton wool pad and wipe away from your eyes. This way you are preventing any of the glitter from being rubbed into your eyes and will ensure that none of it is left behind.